Downloadable Content also knows as "DLCs" add additional content to Dead by Daylight . As of date, there are 18 available DLCs (for Steam, PC), with some being free and some being paid. There also exist several exclusive DLCs that cannot be obtained from any Store. 11 Chapters, which add a new Killer AND a new Survivor. 3 Paragraphs, which add either a new Killer OR a new Survivor. 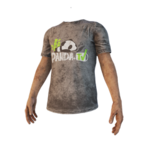 4 Clothing Packs, which add additional Customisation Options. 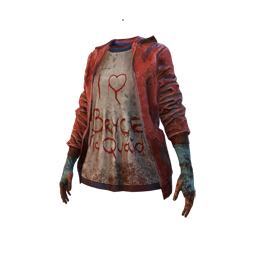 The Clothing Pack DLCs, with the exception of the Charity Case are exclusive to the Steam (PC) version of Dead by Daylight. There are also several non-available DLCs that were exclusive to certain Streamers, Events or give-aways. With the implementation of the in-game Store, in Patch 2.0.0, Players can decide whether to buy a DLC with money on the platforms' respective Stores or with Iridescent Shards (only original Characters) or Auric Cells directly from the in-game Store. Purchasing a DLC with money will unlock an additional cosmetic Customisation Option for the Characters contained in the DLC. Licensed Chapter DLCs are generally locked out from purchase with Iridescent Shards. The prices featured in this Article only apply to the North American Steam Store, they vary depending on one's local currency and platform. The Last Breath Chapter DLC was released for free on 18 August 2016. The DLC adds The Nurse and Nea Karlsson. With exception to the Original Soundtrack, it was the first DLC for Dead by Daylight and also the first free content DLC. The HALLOWEEN® Chapter DLC was released for $6.99 on 25 October 2016. The DLC adds The Shape and Laurie Strode. It was the first DLC containing licensed Characters, in this case from the Halloween franchise. Of Flesh And Mud DLC was released for $6.99 or 18,000 Iridescent Shards on 8 December 2016. The DLC adds The Hag and Ace Visconti. This DLC comes pre-installed on the Console version of the Game. The Spark Of Madness DLC was released for $6.99 or 18,000 Iridescent Shards on 11 May 2017. The DLC adds The Doctor and Feng Min. The A Lullaby For The Dark DLC was released for free on 27 July 2017. The DLC adds The Huntress and David King. It was the third free Content DLC for Dead by Daylight and the second free Chapter next to The Last Breath Chapter. The A Nightmare On Elm Street™ DLC was released for $6.99 on 26 October 2017. 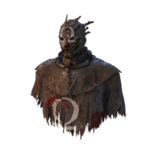 The DLC adds The Nightmare and Quentin Smith. It was the fourth DLC containing licensed Characters. The The SAW™ Chapter DLC was released for $6.99 on 23 January 2018. The DLC adds The Pig and David Tapp. It was the fifth DLC containing licensed Characters. The Curtain Call DLC was released for $6.99 or 18,000 Iridescent Shards on 12 June 2018. The DLC adds The Clown and Kate Denson. The Shattered Bloodline DLC was released for $6.99 or 18,000 Iridescent Shards on 18 September 2018. The DLC adds The Spirit and Adam Francis. The Darkness Among Us DLC was released for $6.99 or 18,000 Iridescent Shards on 11 December 2018. The DLC adds The Legion and Jeff Johansen. The Demise Of The Faithful DLC was released for $6.99 or 18,000 Iridescent Shards on 19 March 2019. The Left Behind DLC was released for free on 8 March 2017. The DLC adds Bill Overbeck. It was the second DLC containing a licensed Character, in this case from the Left 4 Dead series. It was the second free Content DLC for Dead by Daylight. Although the DLC is not available on the Console version of the Game, Bill's Perks are still available to unlock on the Bloodweb . The LEATHERFACE™ DLC was released for $3.99 on 14 September 2017. The DLC adds The Cannibal. It was the third DLC containing a licensed Character. The Left Behind DLC was released for $3.99 on 2 April 2019. The DLC adds Ash Williams. It was the sixth DLC containing a licensed Character, in this case from the Evil Dead series. The 80's Suitcase DLC was released for $2.99 on 23 September 2016. The DLC adds a total of 20 new customisation options for Dwight, Meg, Claudette, Jake, and Nea. It was the first paid Content DLC for Dead by Daylight. The Bloodstained Sack DLC was released for $2.99 on 17 November 2016. The DLC adds a total of 8 new customisation options for The Trapper, The Wraith, The [[Hillbilly] and The Nurse. The Headcase DLC was released for $2.99 on 8 June 2017. 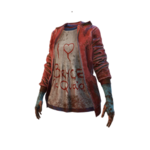 The DLC adds a total of 12 new heads, two each for Dwight, Meg, Claudette, Jake, Nea and Ace. The Charity Case DLC was released for $4.99 on 10 August 2017. The DLC adds a total of 26 new customisation options for Dwight, Meg, Claudette, Jake, Nea, The Wraith, The Nurse and The Huntress. The Dead by Daylight: Original Soundtrack DLC was released for $9.99 on 14 June 2016. This was the first DLC that added new Survivor customisation options for Dead by Daylight. This DLC could only be obtained at PAX West 2016 and NYCC 2016. This DLC includes a new Head attire for Jake Park and Dwight Fairfield. This DLC could only be obtained at PAX West 2016. 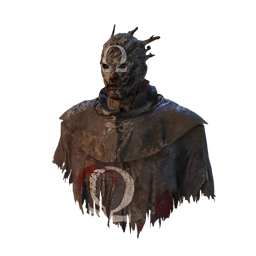 This DLC includes a new Mask for The Trapper. This DLC could only be obtained at TwitchCon 2016. This DLC includes a new Torso attire for Jake Park. 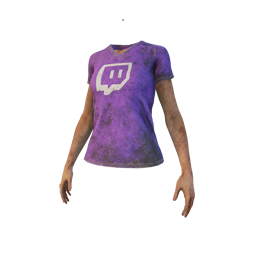 This DLC could only be obtained at TwitchCon 2016 or through special give-aways. This DLC includes a new Torso and a new Leg attire for Claudette Morel and Meg Thomas. This DLC could only be obtained at the Thailand BIG Tournament 2016. This DLC includes a new Head attire for Ace Visconti. This DLC could only be obtained at the Taipei Game Show 2017. This DLC includes a new Torso attire for Ace Visconti. This DLC could only be obtained at the Brazilian Comic Con Experience Tour 2017. 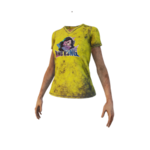 This DLC includes a new Torso attire for Claudette Morel. 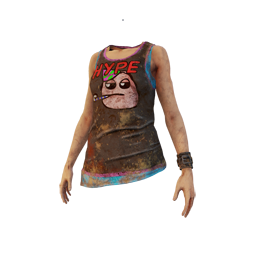 There appears to be another customisation option for Feng Min, that was designed for that Event, but not discovered until April 2018. It remains undistributed to this day. 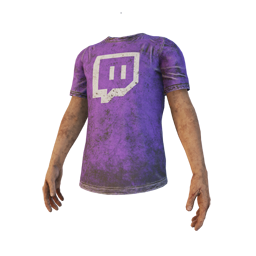 This DLC could only be obtained when purchasing an Item from the official Dead by Daylight Merchandise Store from 15 June to 3 July 2017. 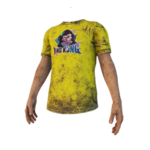 This DLC includes a new Torso attire for Dwight Fairfield. This DLC could only be obtained at Shanghai WePlay 2017. 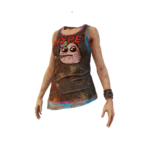 This DLC includes a new Body and a new Torso attire for Feng Min. This DLC could only be obtained at South Korea G-STAR Global Gaming 2017. 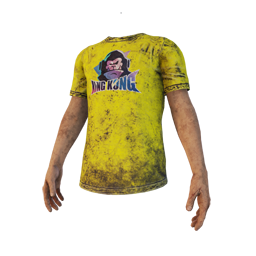 This DLC includes a new Torso attire for David King. There are several DLCs that are exclusive to certain Streamers and YouTubers which give them a unique Item of clothing as a token from the Developers. They are of a unique Rarity called Artifact, its colour very similar to Ultra Rare, but a couple of shades lighter. Those Cosmetics could only be obtained via special codes that said Streamers/YouTubers could give away. 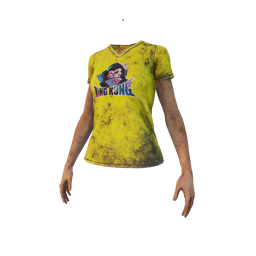 Some added their exclusive Cosmetic piece to the Charity Case, making it available to everyone who bought the DLC. DLCs containing a Survivor and a Killer and adding a new Map to the Game are labelled as Chapters. 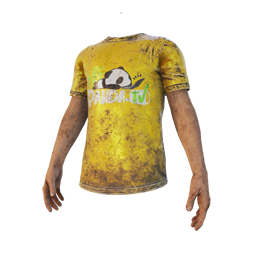 DLCs containing just a Survivor OR Killer are labelled as Paragraphs. DLCs containing only Customisation options are labelled as Clothing Packs. The Last Breath Chapter DLC, when originally launched, required the player to manually install the DLC, this was changed so it is now pre-installed. The Left Behind DLC is exclusive to PC for licensing reasons. With the exception of Bill's Perks, its contents are unavailable to Consoles. 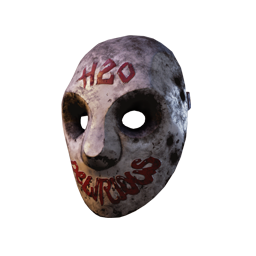 The "Chuckles" Mask is a reference to Chuckles the Bear from Naughty Bear. 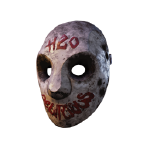 The "Chuckles" Mask is also a reference to the Trapper's BETA name. 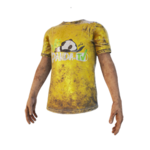 When the Headcase DLC launched, it was wrongfully launched with 5 sets of exclusive DLC clothing. Those had been patched out shortly afterwards. All profits made from selling the Charity Case will go to the Brain & Behaviour Research Foundation. These numbers are associated exclusively with Chapter DLCs. 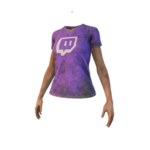 Note: up until Shattered Bloodline, the LEATHERFACE™ DLC was an exception to this rule and titled DLC6, as it was originally supposed to be a full Chapter, but the Survivor (probably Kate Denson) was cut for unknown reasons. As the original actor of Freddy Krueger was called Robert Englund, which sounds and is spelt closely to the country of "England", the Developers labelled the in-game files relating to the A Nightmare On Elm Street™ Chapter as "England". This "gag" continues with subsequent Chapters, with the in-game files associated to a specific Chapter now all being named after a seemingly random country in alphabetical order, with even the Character Icons being named after that scheme as XS and XK, with 'X' replaced with the initial letter of the country and 'S' and 'K' standing for Survivor and Killer. This chain was broken with the addition of Darkness Among Us, which was designated "Kenya", skipping the letters 'I' and 'J'. This was again followed by Demise Of The Faithful, skipping the letter 'L'. A Nightmare On Elm Street™ "England"
Demise Of The Faithful "Mali"
This page was last edited on 16 April 2019, at 12:11.